The CAN Kids - Christopher, Andy, and Nicholas join the world. First Christopher in June 1975 followed by Andy in June 1978 and concluding with Nick in November 1980. Each born at St. Joseph Hospital in Kirkwood, MO. I was there for each birth - what do I remember. I remember taking food to eat when Christopher was born and too excited/exhilarated to eat anything. Andy - he kept trying to come early. We knew he was shouting, "Get me outta here!" & Nick - he went into Neo Natal Intensive Care. He was full term and looked like King Kong in NICU. Fortunately he came home quickly and celebrated his first Thanksgiving with his new family. Three boys in five years, & they were wild ... it was a crazy time. We lost a lot of babysitters. I remember once Andy was in the drivers seat and Nick in the passenger side when Andy disengaged the gear shift. The car rolled backwards - i ran over and tried to hold it back as it rolled into the road. I almost had it stopped until it rolled into our neighbor's beautiful brick mailbox. I watched it tumble over. It was Mothers' Day. Barb cried. Then, there was the time I received a phone call at work from Clarke Elementary School telling me that Nick hadn't shown up for school - he was missing. All kind of thoughts went through my head. I headed home, stopping at friends along the way hoping there had been a Nick sighting. I met up with the police, and suddenly heard "There he goes!" Nick, never the fastest kind, was running through a break in the houses. I got him. He apparently got off the bus and just didn't feel like going to school. & it wasn't always them - trying to teach Chris how to drive was one of the worst kid experiences of my life. I was absolutely horrible. All I could think of was that I would pay anything I had to if someone else would do it. So many memories. Santa's lap ... first friends ... the beach ... new brothers ... horse rides ... Halloween and carving pumpkins ... ear tubes ... picnics ... tree houses ... vacations ... Christmas ... grandparents ... bikes ... appendectomy... birthdays ... soccer ... broken arms ... broken legs ... Easter egg hunts ... school and community plays ... swim teams ... foster babies ... motor scooter ... quiz bowl ... riding the rapids ... mohawk ... jazz and marching bands ... Eagle Scout ... Duffy ... proms. Wow - & so many other memories - just know that raising three boys wasn't easy, but it was still the best time of my life. I was pumping gas one night, and the person next to me said when I asked how are you: "I'm so harried. I have to take the kids here ... I have to take the kids there ... I have to go to the school ... ." I looked at her and said: "I would do anything to trade places with you." The last time we were together was during the 2011Christmas season which found all of us at Thistle Lane, Perkasie, PA which is where Christopher lives. Hannah - Christopher's wife - is sitting on the floor surround by (left to right) Christopher, Nick, Katie - Nick's fiance - Barb, Andy holding Betsy, and me. In 2011,Hannah worked as a Cafe and Catering Manager. Christopher was an Assistant District Attorney with Bucks County. Nick and Katie lived in Chicago. He has been performing for Second City, and she is an Editorial Director. Barb was teaching drama at York School and lives in Pacific Grove, CA. Andy lived in Scottsdale, AZ and is a Territory Manager for SureTek Medical. We had a lot of fun together - all in one house with Christopher, Hannah, Betsy, two cats, and one dog. We toured Philadelphia - and ate ... of course ... Philly Cheese sandwiches. 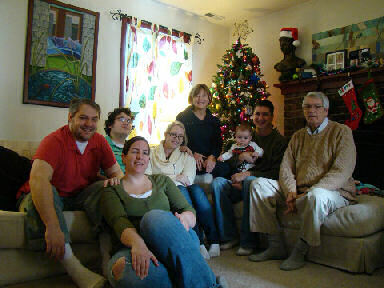 But most of all ... it was Betsy Time - first grandchild ... first Christmas. So what if she had no idea what was going on. We did - & we loved it! Yearly updates keep track of the family as we journey into the future. Follow the three Rees boys from the birth of the oldest to the high school graduation of the youngest. Here comes the next generation! Are you ready? Elizabeth Jane Rees at 2:27 am on April 2, 2011. 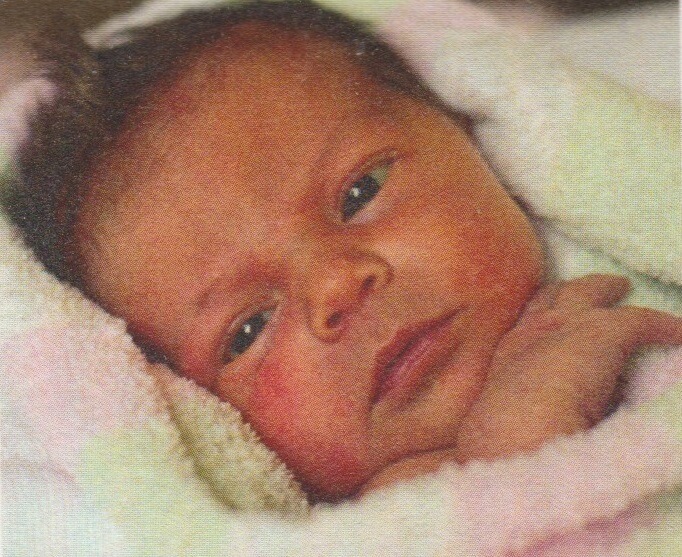 She weighed 5 pounds | 1 ounces & was 17.25 inches long. Christopher asked me if I was on Facebook, and when I said that I wasn't, he told me I should get on it so I could follow my granddaughter. So ... I did. What a rush the beginning of April that year was because I did get to follow the birth of Betsy. It wasn't being there, but it was exciting. All the pictures and stories have come cascading to me in Lamoni via Facebook. Like: My little woodland fairy! ... Happy girl photos. Hanging with Betsy! This place is so kid friendly! Placemats and wipes on every high chair and a toddler play area! ... at Chick-fil-A Quakertown. Betsy loving her teddy! Betsy is 15 months today and one of the cutest things out of her mouth (other than momma, of course) is Bubbles! Sounds more like Buh-Buh, but makes my heart melt. Building stuff. Eating a hamburger minus the hamburger. Little helper in the kitchen. Thank you uncle Andy for installing the cabinet locks. Videos: Proof! Longer than 3 seconds, that is...walking. ... More first steps. ... Graceful like a fainting goat. ... Helping put away groceries. ... Punky carving. ...Watching football with Christopher. Wait ... There's one more! On October 1, 2014 - along came Margaret Alice Rees. Known as Maggie, she was born at 12:00 in the morning ... weighed 7 pounds | 15 ounces & was 19.5 inches long. We folloowed Maggie's birth on Facebook, too. Hannah went into the hospital the day before - September 30th - which is my Late brother Don's birthday. So we were anxiously waiting when this new baby would arrive! She's a GO-GO kid ... full of energy! Keep up with us in the yearly reviews!